I can see how my question is confusing. I use \section and \chapter etc. to organise my document, and I would like to change the way the section and chapter titles are displayed. For the standard classes titlesec would be my choice. Here's an example using titlesec and the standard formatting/spacing, except that the font is changed to Helvetica (Arial has been derived from it) and the font color for demonstration. Adjust the \titleformat arguments to achieve what you desire. Not the answer you're looking for? Browse other questions tagged fonts sectioning titlesec fontsize or ask your own question. 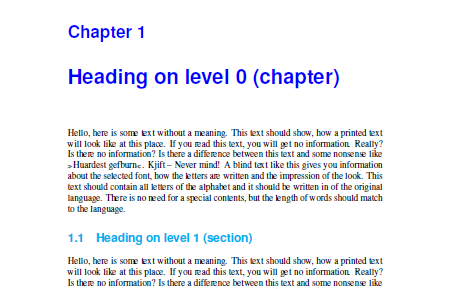 How to edit the properties of chapter and section headings (size of font, positions, indents)? 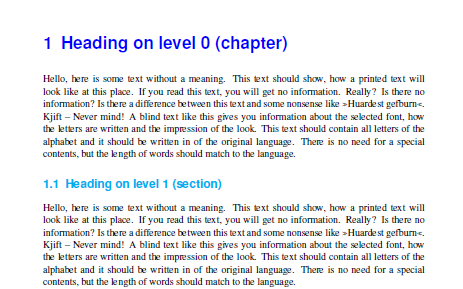 How to set chapter, section headings a specific font? What is the simplest way to typeset an entire document in sans-serif? How to change section/subsection font size? Is there an easy way to change the font and size for Chapter Heading in Memoir? What is the proper way to change the section title font in LaTeX? How to change the font size of sections and subsections?